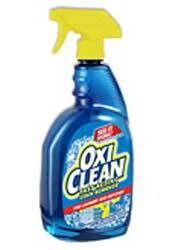 OxiClean Laundry Stain Remover gets out your toughest stains and odors such as wine, blood, dirt, tomato, pet stains, grass stains and even set-in stains. This unique formula starts to work before your eyes so you can be confident the stain will come out. It is chlorine-free and colorsafe. Don’t let stains ruin your favorite clothes. Lose the stain and save the day with OxiClean Laundry Stain Remover!